A few thoughts on the Arsenal 5 Tottenham 2 League match | "It's all about the Arsenal"
The big game approaches and there is the roast beef dinner on the table. Her indoors doing another good job on match day. Not into watching the build up, Ian Wright, Wright, Wright and Glenn Hoddle in the box. Don’t fancy listening to them. 1.25 time to tune in and on goes Sky Sports HD1. Boys got his Arsenal top on and having tonked down the roast, we take out seats in the living room. The ref blows and game under way… Early jostling by both sides to get a foot hold in the game. Nooooooooooo… Arsenal in possession, but Walker win the ball and gives it to Adebarndoor, who in turn finds Saha who shoots and the ball takes a wicked deflection off TV5 and loops over S13’s head to put Spurs 0-1 up. Arggggggggggggghhhh!!!! Where was the defence all over the place, strung out at the back like a line of washing. 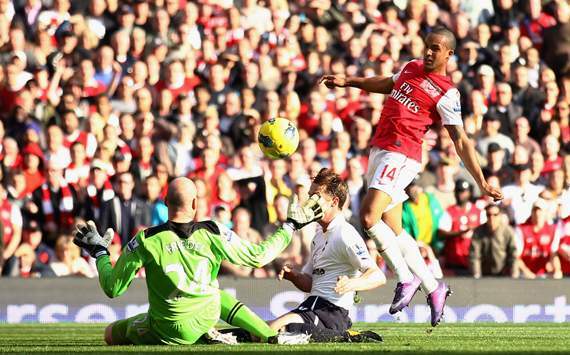 Robin Van (He scores when he wants) Persie again, shoots and the ball comes off Kaboul for a corner. The resulting corner comes over and there is TR7 with a superb header that is well saved by Freidal who touches it over the bar. Pressure!!! Now Tottenham attack and Walker fires over. Arsenal playing well now, and on top. How lucky can you get. After a deflected goal. Spuds attack and with a beautiful through ball from Modric to Bale. Bale runs onto the ball and S13 comes out to stop him. Bale goes down (A dive) , the ref points to the spot. Replays I feel, clearly shows Bale dived and looked for the penalty, Referee Dean could not wait to award it when maybe he should have waited. Arsenal players for once looked to the ref to speak with his linesman. This he did but to no avail. However, he was not sure as he did not even book S13, when normally this would result in a red card. Adebarndoor steps up 0-2 Spurs. Oh dear. Arsenal do not deserve this I thought. Arsenal still keep playing and battling well. Then the ball comes to RVP he shoots and just our luck the ball hits the post, the ball is not cleared and finds its way to Gibbs who plays it to Arteta and his cross finds Sagna and he heads the ball superbly into the net for 1-2 and we’re back… BANG!!! We can do this, we’re the better team. Well on top now. Ball into the Spurs area and their defence fails to clear. The ball falls to Robin van (he scores when he wants) Persie, who shapes up and curls a “Worldy” into the net past the despairing Freidal for 2-2. Two goals in two minutes and reminds me of a game a few years back. Mental is the order of the day here in Harlow. It also seems someone in the crowd had upset ‘Arry and his enforcer Joe Jorden as they looked to have the culprits thrown from the ground. HT 2-2 and what a match. Arsenal want this and they are up for it. Showing some fight and passion at last. Tottenham make two substitutes Van der Vaart and Sandro to beef up their midfield. Arsenal started the second half with no changes. Second half kicks off and Arsenal straight on the attack. 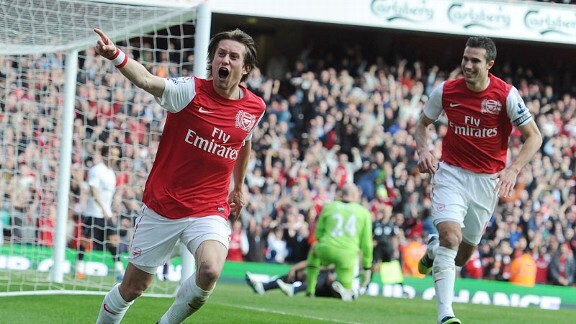 Rosicky finds Benayoun shoots and Freidal tips it just pass the post Oooooooooooooooooooo!!! Walcott is fed by TR7 again and just shoots wide of the far post. it’s all Arsenal. This is brilliant!!! Sandro pick up a yellow for foul on Arteta, becoming the third Spurs player booked after Modric and Parker. This day is becoming one to never forget. Mental!!!! We’re going crazy here. I look at the TV and think I am looking at a replay of Theo’s 4th goal, suddenly realising Theo has just bagged a 5th, delirium here!!! Just brilliant… A through ball by Sagna to Theo who controls and blasts into net 5-2 Arsenal!!! shaking!!!! Scott Parker gets his marching orders for a foul on Tv5, it just gets better. 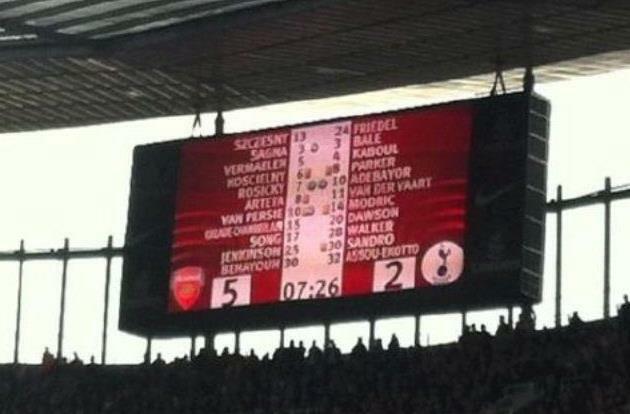 Full time whistle and “The Arsenal have mashed the Spuds 5-2… This is why when your feeling down after results like Milan and Sunderland, football WILL always lift you up with the best of natural highs. was really glad for Arsene Wenger today who after the match said – Arsenal are alive more than anybody thought before the game. Today we gave a performance that on the spirit side, the technical side, the drive of the whole team, on the style of the game we want to play everything was perfect despite a very bad start. I felt in the first five minutes Tottenham started well, after that it was all us for 85 minutes. We were always on top of the game. We were 2-0 down but refused to lose the game and kept going no matter what happened. Once we were back to 2-2 you could see that if we maintained the pace, we would win the game. We had a good balance between offence and defence, between creativity and going into the space behind the defenders and good maturity. We had a great spirit. I must say the way we want to play football depends on the pitch and this was the first time in three games that we played on a football pitch that is really a football pitch. That helps as well. 2-0 and you fuc**d it up… After my earlier Blog today about Journalists, such as Henry Winter and Amy Lawrence doing articles on the “Shift” in the power of North London football and Mr. Winter discussing how only RVP would be the only Arsneal player to get into a mixed Arsenal/Spurs side I hope he suitably embarrassed and I call upon all Gooners to tweet him and let him have it with all barrels. Because of work comitments just finished watching the match!! What a difference a week makes!! 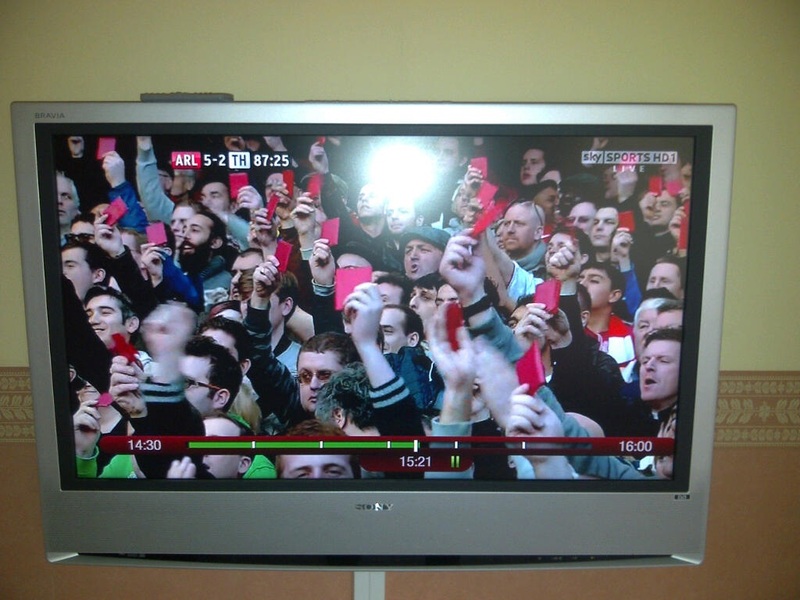 Arsenal till I die!! 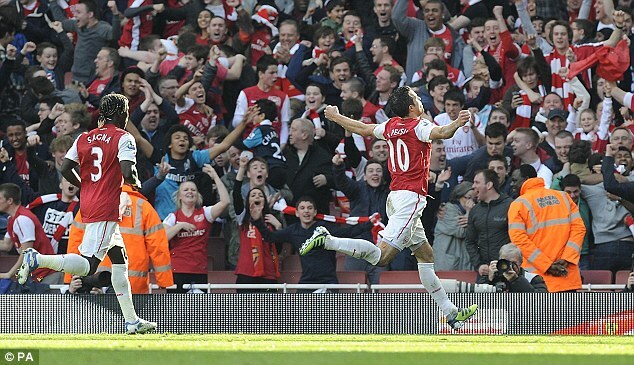 How brilliant was that today? Great review of such a wonderful game! Oh to be a Gooner! My only disappointment in this review was there wasn’t an Arsenal chant in the opening of it, outside of that I really love the blog. Keep up the great work.